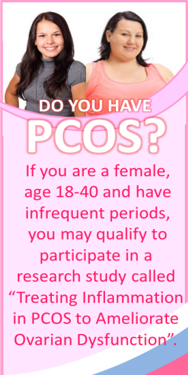 Research Study – Do you have PCOS? Dr. Frank González from the Department of Obstetrics and Gynecology at UIC is seeking women diagnosed with Polycystic Ovary Syndrome (PCOS) for a research study. The goal of this research study is to determine how treatment with a medication called Salsalate can improve the function of your ovaries, change your body’s insulin response to sugar (glucose), and reduce inflammation in your body triggered by certain components in the common diet.